Do you know me? In any case I’ll start by introducing myself, I’m Vortex Coworking, a shared work space in Valencia with a clear mission: to help you on your professional path. How can I do this? Offering not only an office rental, a place to work from, but much more: a community of professionals with whom to share, collaborate and grow in coworking. And I want to do it in the best possible environment, at the epicentre of the Valencian entrepreneurial ecosystem near EDEM, Lanzadera and Innsomnia by Bankia Fintech. 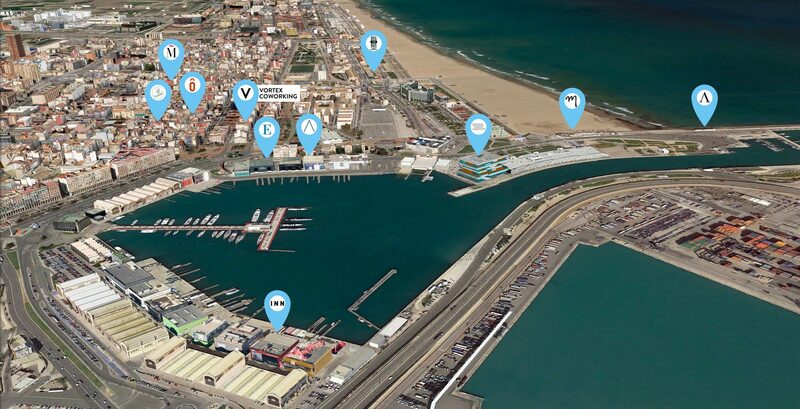 In the port of Valencia, just steps from the beach and in the neighborhood of El Cabanyal. At Vortex we believe in the new way of working: coworking. In helping and being helped, in the synergies that may arise among the coworkers, in the direct and indirect opportunities that arise in a professional environment designed for it, and in going to work every day with enthusiasm and excitement. And, overall, happy. Do you like our philosophy? Do you share our values? If the answer is yes, we encourage you to come and visit us and we will tell you firsthand what comes next in the blog. If the answer is no, keep reading! Make the interaction of the community easy and in a natural way. How? With common areas and two open work areas where coworkers share the space: Focus Zone, more isolated and quiet with capacity for 10 coworkers; Vortex Zone, the epicentre of energy and ideas of coworking, with capacity for 36 coworkers. Additional services to work without worrying about anything else: electricity, water, cleaning, wifi and ethernet and the amount of bills and contracts that are generated by all these services; meeting rooms, reception, business address; and for those who only need coworking a few days per month, virtual office. With a flexible contract commitment, an office rental that can be renewed month by month. This, in addition, allows you to size your office based on the number of employees. How? Renting one more desk when you hire someone new (or vice versa). With coworking you can forget about the limitations of an individual office rental. Family atmosphere to feel at home: a coworking dimensioned for 50 people, optimal number for professionals to produce synergies without giving up the personal and family environment. Make your workday entertaining, offering options for your breaks: shower so you can leave at any time to run to the beach (before coming to work, at noon or at the end); piano enabled with headphones so as not to disturb other coworkers while you play the piano; relax area with sofas to rest or meditate; kitchenette (with free coffee !!) where you can chat with colleagues, ask for advise when you are stuck with something at work or just make plans for the afterwork. Collaborations with our neighbours: EDEM, Lanzadera and Innsomnia by Bankia Fintech. Breakfasts in Vortex and Afterworks in the Cabanyal, the port of Valencia or the beach. Our favorite steps to Vortex Coworking? Casa Montaña, El Viento Bar, El Ultramarinos, Mar de Amura, Veles e Vents, Panorama, Marina Beach SkyBar, La Fábrica de Hielo. But about our neighborhood we tell you more in another blog post. If you did not know me, now you do. And I would like to meet you too, so please come to visit our coworking and enjoy fresh coffee in the kitchenette! And if you already knew me, thank you for trusting me. I hope to meet your expectations and more, because with each new client we learn and improve. Do you know me? In any case I'll start by introducing myself, I'm Vortex Coworking, a shared work space in Valencia with a clear mission: to help you on your professional path.